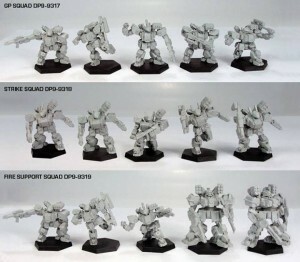 Dream Pod 9 is taking orders for some new squads of mechs over in their webshop. We have pre-releases of the new P.R.D.F. GP, Strike and Fire Support Squads updated with the new Warrior and Warrior IV miniature sculpts and weapon options from the Blood Debt - Peace River Army List e-book. These pre-releases only include the miniatures and do not include the retail packing box that will be done in 2014 and made available to retailers then. Also at the same time we have made available a pre-release of the new P.R.D.F. Army Box and a new P.R.D.F. Task Force Deal using the new sculpts.